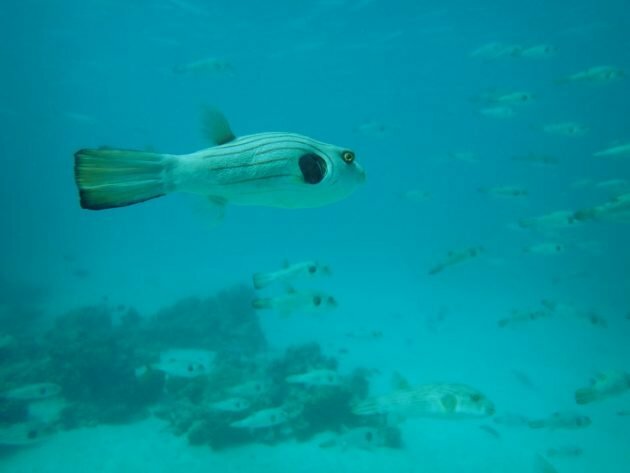 This is a bird blog, and my beat is New Zealand, so let me talk about a fish I saw in Australia. My recent trip was fantastic, and really re-kindled my love of diving, so much so that I’ve started planning and saving for a diving (and birding) trip to Costa Rica in 2019. 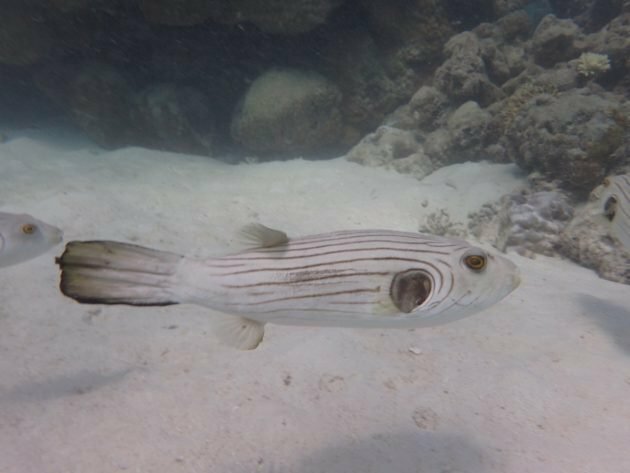 I was able to rent a camera for some of my dives and so will be boring you with some underwater scenes and creatures over the coming weeks (and, I suppose, some birds too). 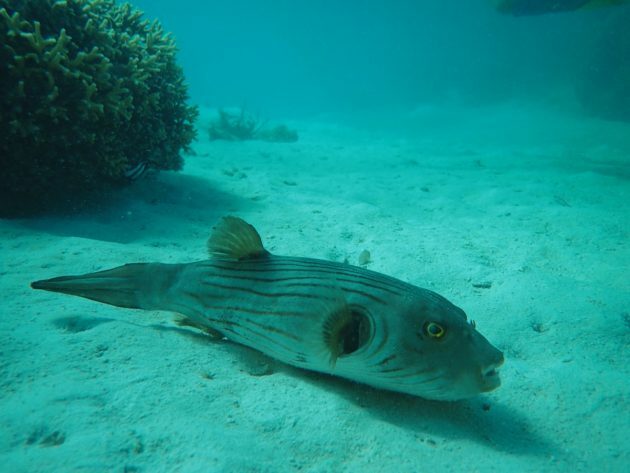 Pufferfish are not particularly rare or common fish that one sees when diving. They are perhaps known for being the dangerous food sensation of Japan, an odd choice of food given how dangerous it is but that is apparently the appeal. 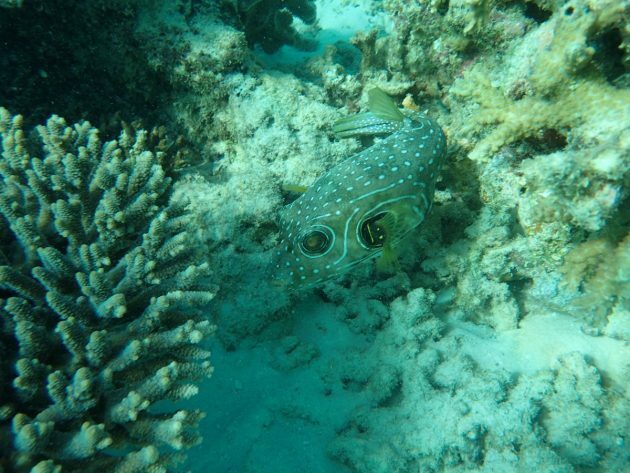 Like the related boxfish and porcupine fish they tend not to be particularly fast or particularly concerned by divers, but they aren’t showy like angelfish or lion fish in a way that attracts much attention. They’re there, and for that reason you may not pay much attention to them. They are kind of odd looking though, and worth a second look. 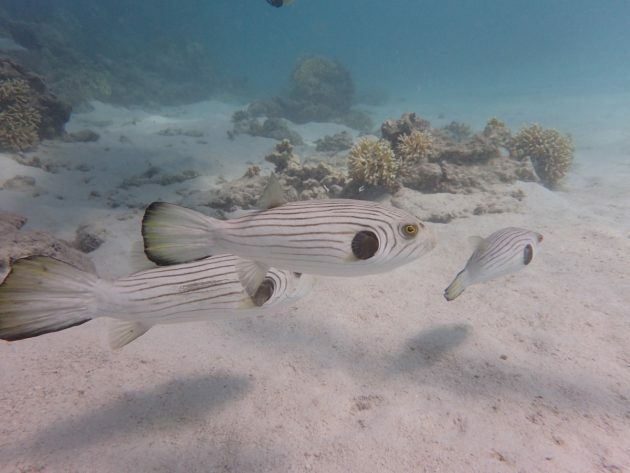 On Nigaloo Reef in Western Australia, where I took these pictures, there were lots of them. Narrow-lined Puffers, to be precise (having a camera while diving makes ID so much easier, otherwise you have to try and remember the markings of dozens of fish until you get back on the boat). Their lack of concern for divers also makes them easy and appealing photographic subjects. Not an outstanding shot, but cool because of the barracuda in the background! 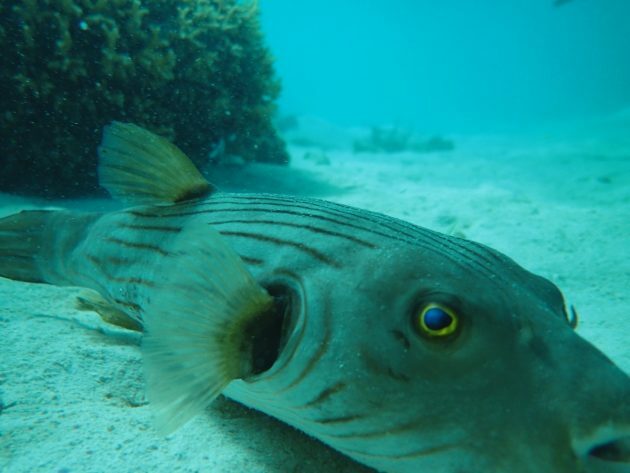 In fact, puffers are pretty antisocial, and this species is noted as being that and solitary on the Wikipedia page of the species. Which made what happened next all the more remarkable. I was straining to take a photo of a nudibranch when I noticed something behind me. Thats a puffer and behind? 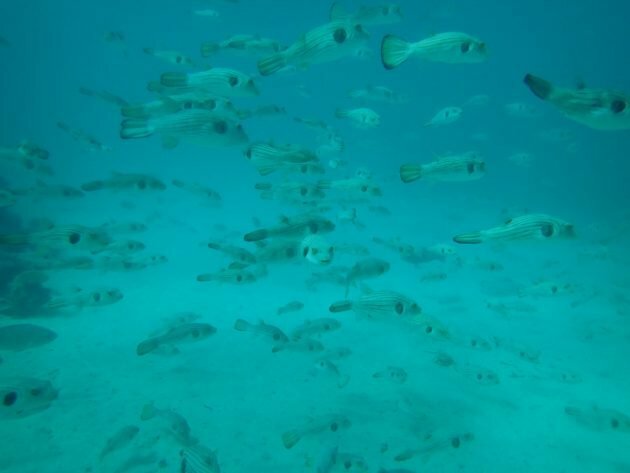 Thats an awful lot of puffers! 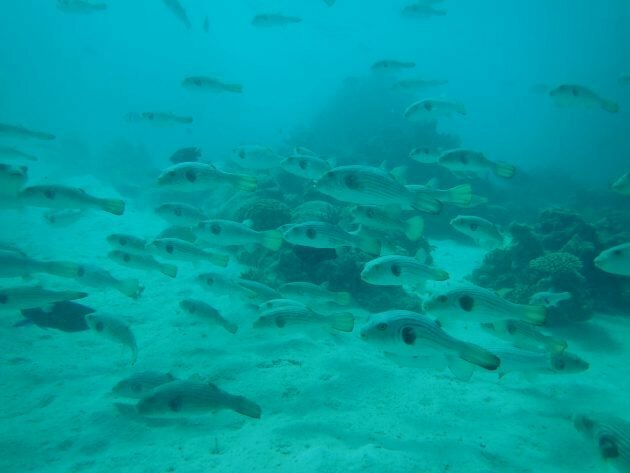 In all my 120 odd dives I’ve never seen shoals of pufferfish like this. I can’t explain it, maybe some kind of breeding aggregation? I’ll have to try and find out. Pretty neat thing to see on a dive though. And to finish, one more, probably another species but closely related. There are so many reef fish that I’ve never had a guide that has them all, or even close to them all. Love this post! 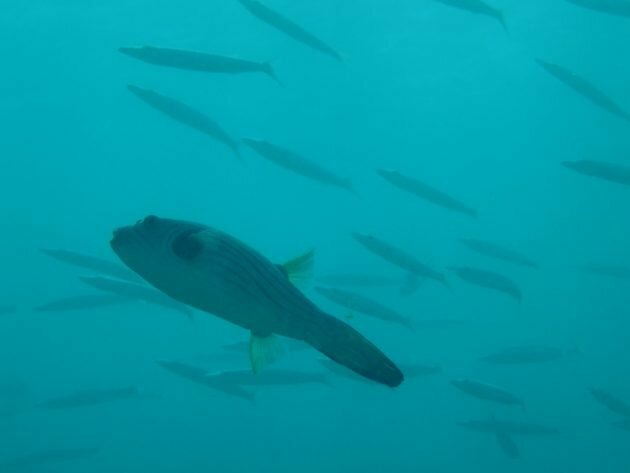 More fish in the birding blog, please.